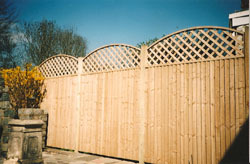 Pre-made fence panels and hurdles make an ideal low cost, yet attractive solution to your domestic fencing needs. Available as standard panels from 3ft to 6ft high, in a vast range of styles. Closeboard fencing is ideally suited for sloping or uneven gardens. Unlike traditional fence panels, closeboard is actually made on site from seperate pieces of timber, but still giving the 'fence panel' effect. Because of this, virtually any height up to 8ft can be achieved using closeboard. 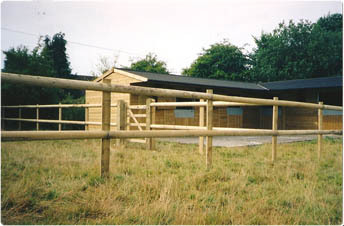 Our equestrian and livestock portfolio includes all aspects of paddock, arena and sand school work, from repairs and budget solutions through to more detailed, traditionally-jointed enclosures. All our fencing is thoroughly checked during and after installation to ensure there are no sharp corners or edges which could harm your animals. 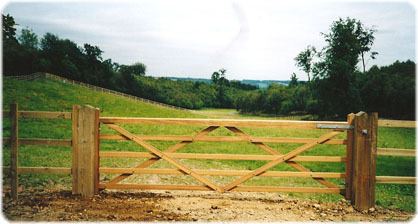 We offer all types of agricultural fencing, from post and rail in a choice of softwood, chestnut and oak, to rustic rails and the full range of stock fencing. Our owned equipment includes tractor, post hole borer, post rammer, JCB and mortise machine to help avoid the extra expense of hiring in extra machinery. A wide variety of Steel security fencing is available, to suit all applications and budgets. Our most popular style of High security fencing is the metal Palisade. Available in various styles, with either hot dipped galvanised or powder coated steel finishes. Powder coated finishes are available as standard in a few different colours, or coated to order in virtually any colour imaginable. Keen, competitive pricing with the assurance of quality materials, workmanship and service. We undertake all manner of fencing and gateway contracts and manage a project from estimate to completion with professionalism throughout. We can prepare and clear ground ready for your project, and we ensure that all waste is removed and that you're satisfied with our work before we consider work completed. Our years of experience mean we can offer you a wide range of traditional and modern methods to suit. From traditional craftsmanship and fencing joinery to machine-assisted agricultural and boundary work, erection of pre-made panels and decorative trellis work, you’ll find us flexible, accommodating and able. Estimates are free of charge and arranged to suit, and we respect your deadlines and your property when we undertake work on your land. All softwood we use has been pressure treated to prevent rotting (with a treatment that’s not harmful to garden plants) and all timber comes from sustainably-farmed forest and woodland. We use local suppliers wherever possible. We carry £1 million of public liability insurance and all the necessary chainsaw and machinery safety certificates. We can also recommend builders, hedge layers and tree surgeons to help you get a project completed by contractors you can trust. Contact us for a free, no obligation quotation at a time which suits you.